Please join us for a complimentary pre-opera lecture in The Paramount Theater Auditorium. 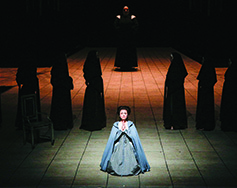 The pre-show lecture for Dialogues des Carmélites will be conducted by Brenda Patterson, mezzo-soprano, former Metropolitan Opera Principal Artist, and Director of Music of Victory Hall Opera. In December 2006, The Metropolitan Opera launched The Met Live in HD, a series of performance transmissions shown live in high definition in movie theaters around the world. The series expanded from an initial six transmissions to ten in the 2014-15 season and today reaches more than 2,000 venues in 70 countries across six continents. The Live in HD performances are later also shown on public television, and a number of them have been released on DVD. In partnership with the New York City Department of Education and the Metropolitan Opera Guild, the Met has developed a nationwide program for students to attend Live in HD transmissions for free in their schools. The Paramount began broadcasting during the in 2008-09 season and is pleased to continue to present this series for the community. Isabel Leonard as "Blanche de la Force"
Adrianne Pieczonka as "Mme Lidoine"
Karen Cargill as "Mère Marie"
Karita Mattila as "Mme. De Croissy"
David Portillo as "Chevalier de la Force"
Jean-François Lapointe as "Marquis de la Force"